FOR considerably more than a century the locomotive has been one of the most important factors in the civilization of the world. It is certain that the development of industry as we know it to-day would have been impossible without the means of rapid transport provided by the railways and the steam engine. The first steam engine to run on a railway was built by Richard Trevithick in the year 1803. Special tracks to accommodate loaded wagons, drawn by horses or other means, had been developed, however, for two centuries before that time. Trevithick advocated the use of high-pressure steam as against the low-pressure of the cumbersome pumping engines in operation at the beginning of the last century. It was while constructing some high-pressure steam engines for the Peny-darran ironworks, near Merthyr Tydfil, that Trevithick was persuaded to build a steam locomotive to haul trucks on the works tramway, until then served by horses. This original locomotive used steam at high pressure and weighed 5 tons. It was first tried on February 13, 1804, hauling a load of 20 tons at 5 miles per hour. Full details of this locomotive are not available, but the single cylinder is stated to have been 8¼-in diameter with a stroke of 4 ft 6-in. A very important feature of the engine was the discharge of the exhaust steam into the chimney to draw up the fire, the principle being still applied at the present day. A year later an engine was built at Newcastle to Trevithick’s design for the Wylam wagon way. This locomotive had four flanged wheels, to which were connected by gear wheels a crankshaft and a flywheel driven by a single cylinder. In 1808 Trevithick exhibited in London a locomotive weighing 8 tons, which ran at 12 miles an hour on a circular track. The public were allowed to ride behind the engine for a small fee. Trevithick’s engines, although quite successful mechanically, were, however, ahead of their time because the available track was not strong enough to bear the weight of a steam locomotive. Trevithick, therefore, did nothing further for locomotive development, but his genius has been perpetuated in the retention to-day of the principles he adopted more than a hundred years ago. An attempt to overcome the difficulty arising from insufficiently strong rails was made by John Blenkinsop in 1811, who used a cogged driving wheel, which engaged with teeth cast on one side of the rails. A line of this description linked the Middleton Colliery to Leeds in 1812, and a year later the collieries of Kenton and Coxlodge were joined by rail to the Tyne. 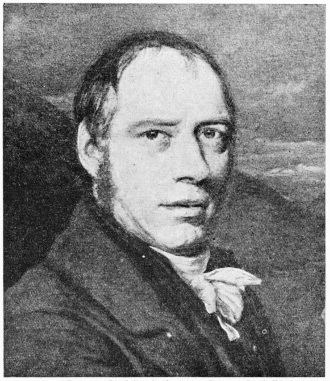 RICHARD TREVITHICK, 1771-1833, has been described as the Father of the Locomotive. Trevithick advocated the use of high-pressure steam, and his experiments paved the way for all subsequent developments in railway engines. The engines on this line were fitted with two double-acting cylinders driving two shafts, with cranks set at right angles. These crankshafts were both geared to a shaft carrying the large cogwheel, which engaged with the rack or toothed rail. The engines in use at Leeds were at work until 1835. 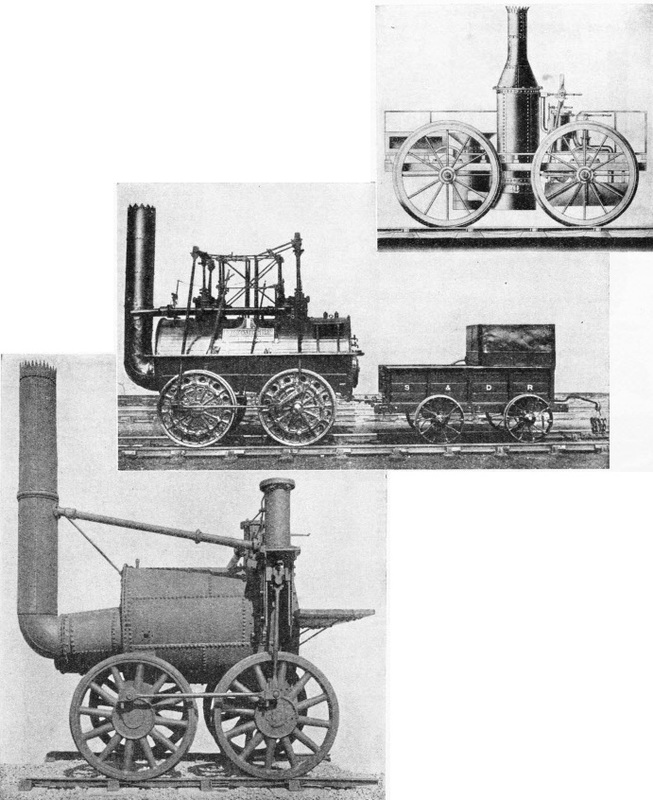 The next step in locomotive development is ascribed to William Hedley, who in 1813 designed an engine for the Wylam Colliery, the wooden rails of which had been replaced by cast-iron plates to facilitate steam haulage. This locomotive was the famous “Puffing Billy”, now in the Science Museum at South Kensington. The engine ran on four wheels coupled together by means of cog-wheels and was driven by a pair of vertical cylinders. The boiler was fitted with the “return flue” introduced by Richard Trevithick. The fire-hole was situated alongside the chim-ney, and the flue, running to the back of the boiler, was doubled back U-fashion, to provide the greatest possible heating surface between the fire and the water. A tender, carrying the water tank, was attached to the engine, which, however, proved too heavy for the cast-iron plate rails, and it was rebuilt in 1815 as an eight-wheeled locomotive. It was altered again to a four-wheeler in 1830, when the Wylam line was re-laid with stronger edge rails of cast iron. This rebuilding provides an interesting sidelight on the interdependence of locomotive development with that of the track on which it runs. It was this relationship be-tween the progress in loco-motive building and the con-struction of railways that was so keenly appreciated by the great George Stephenson, who devoted his time not only to the improvement of the engine itself, but also to railway construction and dev-elopment. It is not generally realized how great a debt is owed by the railways to the old coll-iery companies, out of whose needs for cheap haul-age grew the development of the steam locomotive. It was as engine-wright at Killing-worth Colliery that George Stephenson in 1814 built the first engine to run on iron edge-rails without the use of the rack and pinion as empl-oyed by Blenkinsop. The first Killingworth locomotive was, however, modelled on that of Blenkinsop, and had two vertical cylinders 8 in in diameter by 24 in stroke, driving two countershafts. These countershafts were geared together and to the driving wheel axles, an arrangement which, although successful, was also noisy. To overcome this difficulty Stephenson built at Killingworth in 1815 a second engine which, after a certain amount of experiment, was fitted with connecting rods driving the wheels directly, the running axles being fitted with sprockets coupled by a chain similar to that now used on bicycles. A single flue supplied the heating surface for the boiler of this engine, and the exhaust steam from the cylinders was taken to the chimney. These early engines were constructed without springs to the wheels, and, as a result, derailments, due to the uneven track, were frequent. Stephenson overcame this difficulty in a most ingenious way, without, however, using springs such as we have to-day. In 1816 he constructed an engine in which the axle bearings were free to move up and down in guides, and were attached to pistons contained in cylinders fixed to the underside of the boiler. The pistons in these cylinders were exposed to the pressure of the boiler steam, and by this means the wheels were maintained in contact with the rails despite inequalities of the track. George Stephenson built several of these “steam-sprung” engines between 1816 and 1822, so providing a successful type of locomotive for hauling heavy colliery loads at low speed. The next step forward was the provision of railway transport for passengers, their requirements tending to speeds above that to which they were accustomed when travelling by stagecoach on the roads. The first public railway in the world, the Stockton and Darlington Railway, was authorized in 1821, and George Stephenson was appointed engineer in the following year. Here again Stephenson displayed his genius for development by advising the Company to apply for a new Act of Parliament giving power to carry passengers in addition to goods, and to use steam locomotives. 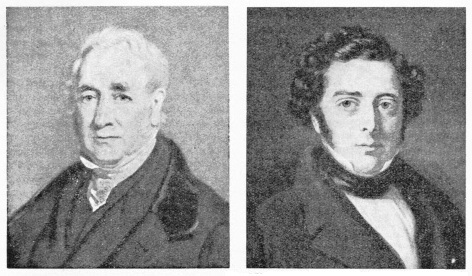 From that time onward George Stephenson confined his attention to railway construction, leaving the improvement of the locomotive to his son Robert and his associates. The firm of Robert Stephenson & Co was responsible for the building of the Stockton and Darlington Railway's first engine “Locomotion”, which ran at the opening of the line on September 27, 1825. This famous engine is now preserved at Darlington Station, on the London and North Eastern Railway. There are four wheels, driven directly by two vertical cylinders through connecting rods. The wheels were not sprung, but inequalities of the track were allowed for by mounting one of the axles in a tube with a central pivot under the boiler, an arrangement somewhat similar to that employed for the front wheels of a modern steam traction engine. The weight of the engine in working order was about 8 tons, and it was capable of hauling a load of some 50 tons at 5 miles an hour on a level track. The boiler was of the single flue type, similar to that of the Killingworth locomotive. During 1825, and for a few years subsequently, many new types of locomotive were tested on the Stockton and Darlington line. A particularly interesting example was the engine built by Robert Wilson, of Newcastle, which had four cylinders all driving directly on to one axle. In 1827, Stephenson and Co. built an engine with a pair of horizontal cylinders placed inside the boiler, and from which the drive was taken to the wheels by means of rods and levers. The same year a further improvement in locomotive design was effected by Timothy Hackworth, engine superintendent of the Stockton and Darlington Railway, by his construction of the “Royal George”. This engine was built from the remains of Wilson's locomotive. The vertical cylinders were raised and inverted, so providing a direct drive to the wheels by means of short connecting rods. The boiler was made with a Trevithick’s pattern return flue, and this had a much larger heating surface than those used for earlier engines. The exhaust pipe orifice in the chim-ney was contracted to increase the draught. The engine had six wheels, with an arrangement of compensating levers in place of springs. It is said that iron springs were first used for locomotive work at Killingworth early in 1827, wrought-iron tyres for engine wheels having been introduced about the same time. The next improvement of note was the locomotive “Lancashire Witch”, built to Robert Stephen-son’s design in 1828. This engine had four-coupled wheels driven by two inclined cylinders. The drive from the cylinders was taken by crank-pins on the front wheels, and both axles were fitted with springs. The boiler contained two flues, having a fire-grate in each, with, however, a single chimney. The engine was put to work on the Bolton and Leigh Railway, using coke as fuel, the necessary additional draught being supplied by bellows. The engine was also fitted with valve gear which enabled steam to be cut off at half-stroke, so using the steam expansively and economizing fuel. The weight of this locomotive was 7 tons, and it was capable of hauling a load of 50 tons up a gradient of 1 in 440 at a speed of 8 miles per hour. Several engines were subsequently built to this design. The next important develop-ment in locomotive con-struction was brought about in 1829 by the building of the Liverpool and Manchester Railway, the first of many lines destined to play a great part in the development of Lancashire’s cotton trade. At that period the design of steam locomotives had made but little progress, and the directors of the new railway were uncertain whether to employ locomotive engines or to make use of stationary engines by the side of the track which would haul the trains by means of ropes. A committee, Messrs. J. U. Rastrick and James Walker, was appointed to visit such railways as then existed, to report on both systems of haulage. The report, present-ed on March 9, 1829, found in favour of stationary engines and ropes, but some of the Liverpool and Man-chester Railway directors, with George Stephenson, then the Company’s engin-eer, strongly urged the use of the steam locomotive. The following month, therefore, the railway company offered a prize of £500 for the best engine of improved design which would conform to their requirements. An important condition of the competition was that each locomotive should consume its own smoke and haul continuously a load equal to three times its own weight at an average speed of not less than 10 miles an hour. It was decided that the trials should be held on a level stretch of line at Rainhill, 9 miles from Liverpool. The judges were Messrs. J. U. Rastrick, Nicholas Wood, and John Kennedy. The length of the “course” was 1½ miles, with an additional 220 yards at each end for starting and stopping. Each locomotive was required to haul its load for ten double trips on the course, equal to a journey between Manchester and Liverpool. The engine was then to be provided with a fresh supply of fuel and water and a further ten trips made, equivalent to the return journey. The trials were held between October 8 and October 14, 1829, the competing engines having been delivered at Liverpool on October 1. The locomotives entered for the trials were the “Rocket”, by George and Robert Stephenson; the “Novelty”, by John Braithwaite and John Ericsson; Timothy Hackworth’s “Sans Pareil”; and the “Perseverance”, by Timothy Burstall. T. S. Brandreth entered his “Cycloped”, a carriage propelled by means of a horse on a treadmill. 1781-1848, and his son, Robert Stephenson, 1803-1859, whose great work in the development of the steam locomotive and the railway laid the foundations of rail transport systems all over the world. The “Rocket”, designed by George Stephenson and built by his son Robert, ran at Rainhill on October 8, 1820, hauling 12¾ tons (the engine weighed 4¼ tons) at an average speed of 13·8 miles an hour, attaining for one trip a maximum speed of over 24 miles per hour. Without any load, however, the engine ran at a speed of 29 miles an hour. The “Rocket” was, in fact, the only locomotive to fulfil all the conditions of the competition, and was awarded the prize of £500. The “Rocket” is now in the Science Museum at South Kensington, London, but some of its details, have been altered since the Rainhill Trials. The cylinders, for example, were originally set at an angle of 35 degrees with the horizontal, but were altered in 1831 to an inclination of 8 degrees. Alterations were also made to the firebox, and a smoke-box was added at a later date. The “Rocket” ran on four wheels, the front pair being driven by a pair of cylinders 8-in diameter, with a stroke of 17-in. The cylinders were mounted on iron plates bolted to the boiler shell. The slide valves admitting steam to the cylinder were operated, through a system of levers, by a pair of eccent-rics on the driving axle, one being set for forward runn-ing, the other for reverse. Either of these eccentrics could be brought into operat-ion as required by means of a foot pedal, the valve rods being worked by hand during reversing. The “Rocket” had an iron boiler 40 in diameter by 6 ft long, fitted with 25 copper fire-tubes each 3-in diameter. The boiler worked at a pressure oF 50 lb per sq in. The tender consisted of a four-wheeled truck to carry the fuel, water being carried in a large wooden barrel mounted above it. The “Novelty” was tried on October 10 and 14, but mechanical defects develop-ed on both occasions so that the engine was unable to complete the journey. This engine had four wheels, each 4 ft 2 in diameter, driven by a pair of vertical cylinders, 6-in diameter by 12-in stroke. The boiler was of unusual design, having a vertical barrel containing the firebox, attached to a horizontal barrel 13-in diameter and 10 ft long, in which was placed a flue tube 31 ft in length leading from the firebox to the chimney. The flue was arranged in a three-limb coil. A mechanical blower was provided for the coke fire, and the exhaust steam escaped directly into the air. The locomotive’s weight was 3·05 tons empty, and with a load of 77 tons, the maximum speed of the engine at Rainhill was just over 16 miles an hour With a light load the “Novelty” attained a speed of 31 miles an hour. T he “Sans Pareil” was tried on October 13, 1829, although the engine was disqualified from earning the prize on account of its weight, 4·77 tons. It should have been carried, according to the competition rules, on six wheels instead of the four provided. The engine ran for 27½ miles at an average speed of 13·95 miles an hour with a load of 14·32 tons. The maximum speed for one trip was 17½ miles an hour, but the failure of the boiler feed pump put an end to the trial. The two cylinders were 7-in diameter by 18-in stroke, driving on four-coupled wheels 4½ ft diameter. A tender was provided similar to that of the “Rocket”. The original “Sans Pareil” is also to be seen at South Kens-ington, and, apart from the trial at Rainhill, has a most interesting history. The Liverpool and Manchester Railway Company bought the locomotive after the trials, and in 1832 it was transferred to the Bolton and Leigh Railway. In 1837, the present cylinders, larger than the originals, were fitted, the wooden-spoked wheels being replaced by wheels of cast iron. In 1844 the locomotive was removed to Coppull Colliery, near Chorley, and adapted for use as a stationary engine to drive pumping and winding machinery, where it worked until 1863. It was then re-erected as a locomotive and presented to the Science Museum. The “Perseverance” and the horse-propelled “Cycloped” attained speeds of 6 miles an hour only, and were consequently withdrawn from the competition. The success of George Stephenson’s locomotive, which had so lasting an influence on engine design and railway develop-ment, was largely due to its tubular boiler, the use of which was suggested by Henry Booth, the secretary of the Liverpool and Manchester Railway. The use of fire tubes to convey the heat of the furnace from the boiler firebox through the water to a smoke-box has now been standard locomotive practice for over a century. Steam locomotive boilers have been increased enormously in size and details of design have been perfected The giant locomotives in use all over the world to-day, however, still employ the same basic principles in generating steam as those used in the design of the “Rocket”. You can read more on “America’s First Trains”, “The Atmospheric Railway” and “When Railways Were New” on this website. “PUFFING BILLY”. 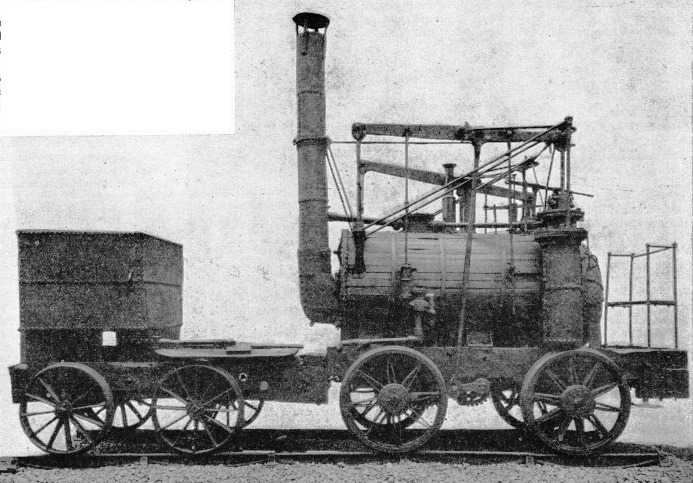 This famous locomotive was designed by William Hedley for the Wylam Colliery in 1813. The engine had two vertical steam-jacketed cylinders, 9-in diameter by 36-in stroke, driving the wheels through gearing. The platforms for the fireman and driver were at opposite ends of the boiler. BLENKINSOP’S LOCOMOTIVE was built in 1812. It weighed only 5 tons and cost £400. To obtain the necessary adhesion, a large toothed wheel, driven through gearing by a pair of vertical cylinders, engaged with notches arranged alongside one of the running rails. The wooden structure over the cylinders is a “silencer” to reduce the volume of sound made by the steam exhausting into the atmosphere. GEORGE STEPHENSON’S KILLINGWORTH LOCOMOTIVE was driven by a pair of vertical cylinders 9-in diameter by 24-in stroke, half sunk in the boiler. The connecting rods drove direct on to the wheel crank-pins. The axles were fitted with toothed wheels over which passed a chain so that the cranks were maintained at right angles. THE “PERSEVERANCE” was entered by Timothy Burstall for the Rainhill Trials in 1829. It had a vertical boiler with a furnace alongside, through a hopper on top of which fuel was fed to the fire. “SANS PAREIL”, built by Timothy Hackworth, attained a speed of 17½ miles an hour at the Rainhill Trials, and hauled a load of over 14 tons at an average speed of 14 miles an hour. The two cylinders were 7-in diameter by 18-in stroke, driving four coupled wheels, each 4½ ft diameter. A tender similar to that of the “Rocket” was attached to the engine. 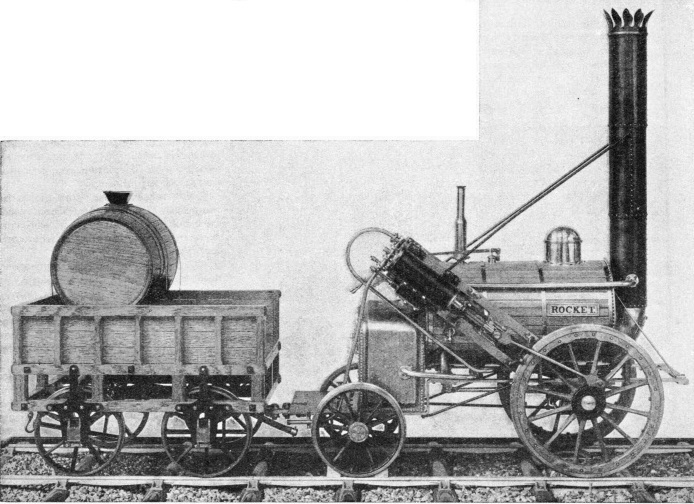 THE STOCKTON AND DARLINGTON RAILWAY’S first engine, “Locomotion”, built by Robert Stephenson & Co, in 1825. This engine weighed 8 tons and hauled a load of 50 tons at 5 miles an hour on level track. 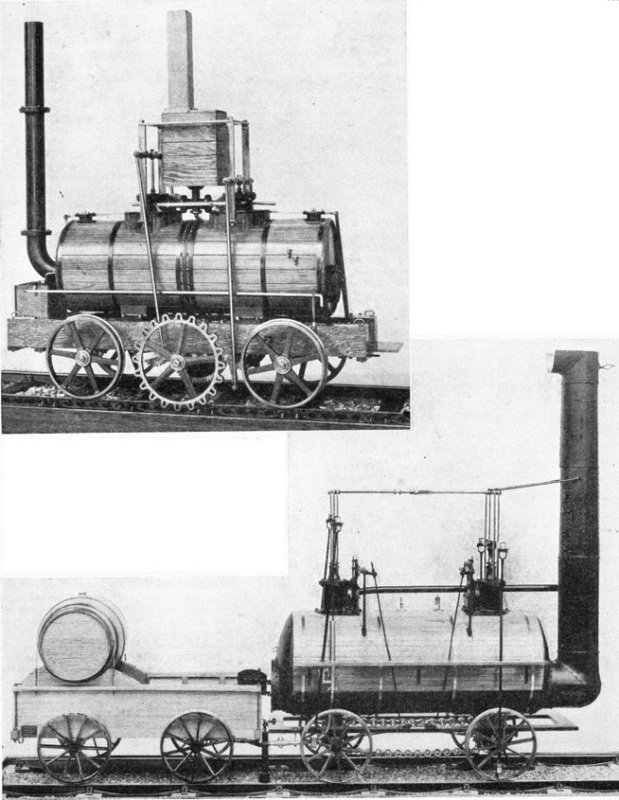 THE “ROCKET”, entered by the Stephensons for the Rainhill Trials, won the prize of £500 offered by the Directors of the Liverpool & Manchester Railway and proved the efficiency of the steam locomotive. This picture of a scale model in the Science Museum, South Kensington, shows the “Rocket” as it appeared at Rainhill in 1829. The original engine, subsequently altered in some details, is also in the Museum. 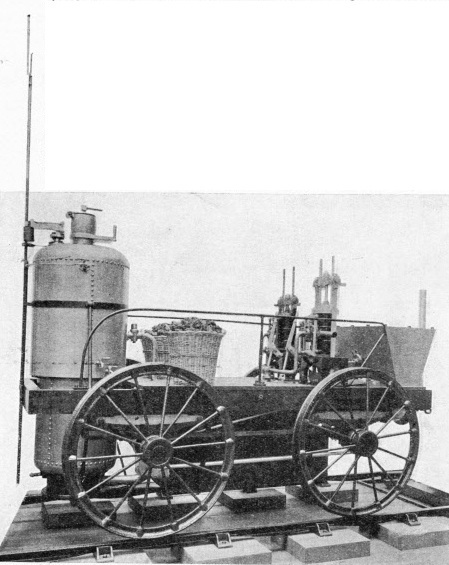 THE “NOVELTY”, designed by John Braithwaite and John Ericsson, achieved a maximum speed of 16 miles an hour with a load of 7½ tons at the Rainhill Trials. A full size reproduction of the locomotive is in the Science Museum, South Kensington.